what fun! I'm so sorry we missed it. I did have a good time camping with the ward folks up north. Looks like you had a great time and that the weather cooperated. Did you pull the little one in the trailer or did she ride in the van mostly? Thanks for the post/update/pictures! Little A was in the van for the trip. 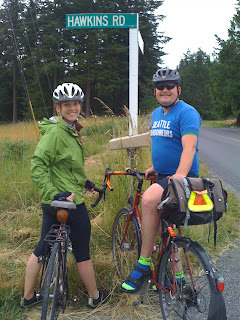 Brad pulled T up some MONSTER hills though on Orcas during our fun meanders. I also noticed that there are more pictures of me laying in the back seat of the car than of me on my bike. I wonder what that says about me and my work outs. I'm so homesick for T and A! Thank you for organizing such a fantastic trip and for including us in your family. I almost feel like an honorary Foley Hawkins now and am eagerly awaiting our next adventure!